Bornprettystore : Blue Crackling Nail Polish | Memorable Days : Beauty Blog - Korean Beauty, European, American Product Reviews. Remember my Bornprettystore haul? Most of you girls were curious about the crackling nail polish that I got from that store, so I decided to review that product first. The crackle nail polish is from the brand Laushine, a Chinese brand. All colors looked so awesome on the bornprettystore website, so it was hard to choose. However, I eventually chose the dark blue crackle polish because I thought that it would be great with a silver nail polish (that I recently bought) as the base color. I applied two layers of the silver nail polish from Essence as the base color. It's the Essence nail art cracking base color, #02 Sparkling Silver that I used. Note: Before application, you really have to shake the nail polish very well! 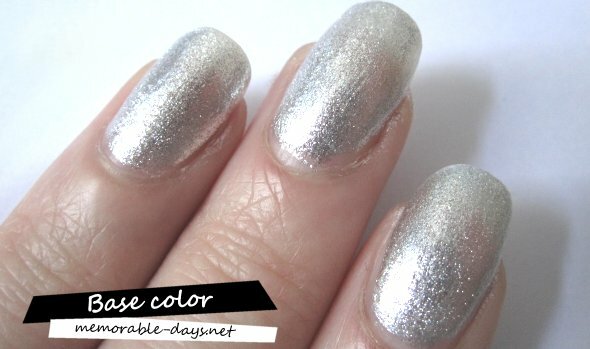 I really like the color of this crackling nail polish :D, it matches perfectly with the silver nail polish. It also dries within a second which is extremely fast. This nail polish has a matte finish as you can see on the picture below. The packaging looks awesome, as you can see on the first picture of this blogpost! I totally love the glass bottle. The brush of the nail polish is good as well and it's very easy to apply. This brush is even better than the one from Barry M that I tried a few days ago. 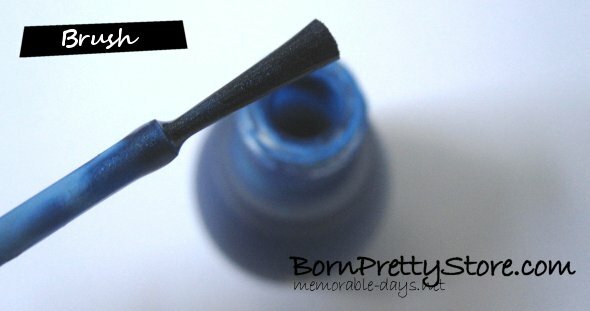 You can buy the blue crackling nail polish at Bornprettystore.com. They are selling it for $5,50. A lot more colors are available, you really should check it out cause the green and purple one are looking awesome as well :D! Go to this link to check out their assortment: Cracking polish. The crackling nail polish that I received wasn't the same as the one on the picture from their website. It's from a different brand and the color is slightly different too, but I totally prefer this one, especially because of the pretty packaging. This one looks way better than the one on that picture. This crackle nail polish is awesome! I love the color, packaging and the brush! It's easy to apply and it cracks within a second! Besides, I think that the product is affordable as well. I couldn't stop staring at my nails because they were looking awesome, haha no kidding! I will definitely buy the other colors ^____^♥! This product was sponsored by Bornprettystore for review purposes. My reviews are completely honest, read the disclaimer for more information. @yak man, michelle, robin, you can buy it at bornprettystore :D free shipping!!! @Rinny, yesss i also think it's cool that they have different colors :D !! Wow what a nice post such a nice information you provide us about beauty products its very good for us and i like it so much. I like the matte blue against the silver. It seems to crackle really well and the price is SO much better than OPI :P Great review!